Appendicitis is a very common cause of emergency surgery. The problem most often occurs when the appendix becomes blocked by feces, a foreign object, or rarely, a tumor. The symptoms of appendicitis can vary. It can be hard to diagnose appendicitis in young children, older people, and women of childbearing age. The first symptom is often pain around the belly button or mid upper abdomen. Pain may be minor at first, but becomes more sharp and severe. You may also have a loss of appetite, nausea, vomiting, and a low-grade fever. The pain tends to move into the right lower part of your belly. The pain tends to focus at a spot directly above the appendix called McBurney point. This most often occurs 12 to 24 hours after the illness starts. Your health care provider may suspect appendicitis based on the symptoms you describe. Your provider will do a physical exam. 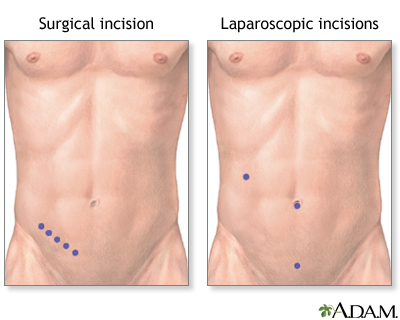 If you have appendicitis, your pain will increase when your lower right belly area is pressed. 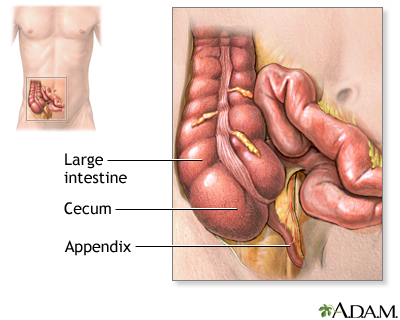 If your appendix has ruptured, touching the belly area may cause a lot of pain and lead you to tighten your muscles. Most of the time, a surgeon will remove your appendix as soon as you are diagnosed. If a CT scan shows that you have an abscess, you may be treated with antibiotics first. 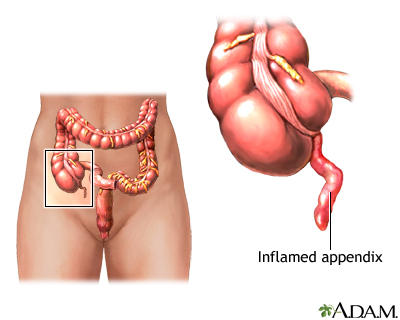 You will have your appendix removed after the infection and swelling have gone away. The tests used to diagnose appendicitis are not perfect. As a result, the operation may show that your appendix is normal. In that case, the surgeon will remove your appendix and explore the rest of your abdomen for other causes of your pain. Most people recover quickly after surgery if the appendix is removed before it ruptures. Call your provider if you have abdominal pain in the lower-right portion of your belly, or other symptoms of appendicitis. Sarosi GA. Appendicitis. In: Feldman M, Friedman LS, Brandt LJ, eds. Sleisenger and Fordtran's Gastrointestinal and Liver Disease. 10th ed. Philadelphia, PA: Elsevier Saunders; 2016:chap 120. Sifri CD, Madoff LC. Appendicitis. In: Bennett E, Dolin R, Blaser MJ, eds. Mandell, Douglass, and Bennett's Principles and Practice of Infectious Diseases, Updated Edition. 8th ed. Philadelphia, PA: Elsevier Saunders; 2015:chap 80. Smith MP, Katz DS, Lalani T, et al. ACR appropriateness criteria right lower quadrant pain -- suspected appendicitis. Ultrasound Q. 2015;31(2):85-91. PMID: 25364964 www.ncbi.nlm.nih.gov/pubmed/25364964. Wolfe JM, Henneman PL. Acute appendicitis. In: Marx JA, Hockberger RS, Walls RM, et al, eds. Rosen's Emergency Medicine: Concepts and Clinical Practice. 8th ed. Philadelphia, PA: Elsevier Saunders; 2014:chap 93.